Now my ducks may wander from time to time but they have always managed to find their way back. Not this time. Not only are they not in a row, I am missing a few. Did they leave on their own free will or were they abduckted? It doesn’t matter; I just want them back, I miss them. I want them in a row. 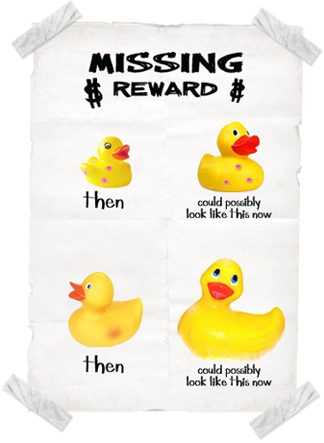 Bad things happen when your ducks are misplaced. Where are your ducks? Are they all accounted for…or have they wandered too? You no longer think clearly. You ‘accidentally’ lock your keys in the car…while it’s running. You have someone bring you your spare set. Woot-Woot! You push the “unlock” button, again. The car won’t unlock, it is running. Assuming the person who brought you the spare still has their ducks, you rely on them for suggestions. They have none. You eventually notice this foreign object dangling next to the “unlock” button. You take your beloved pet, Fluffy to the vet. As you are writing them a check that wipes out your life savings & kids college fund, they explain to you that fluffy has an ear infection. They give you drops, 3 drops, 3x a day…yadda, yadda, yadda. You follow directions precisely, 3 drops, 3x a day in the infected ear. It’s a struggle, but you are a caring, responsible pet owner. You owe it to Fluffy. Perhaps it would be easier for both of you with the help of another. You comfort and position Fluffy as you explain the routine to your brave helper. This person obviously does not have a duck problem. Their ducks are not only all accounted for, they sit prim and proper in the most perfect row you have ever seen. Your brave helper must have sensed your “problem” prompting them to read the directions for themselves. It was then you learned…you were horrified….how could you? Those drops were an antibiotic, to be administered orally. You awake after a good night sleep. You climb into a nice, hot shower to prepare for your day. By now you have your routine down. Lather. Rinse. Repeat. If you are a girl (woman, if you will) your routine generally consists of shaving. You love the feeling of those baby soft legs. The ‘pits’ are a must, and then there’s the bikini line (vay down there!) You lather up with your favorite shaving cream. A razor is a dangerous object but you are an adult and you have done this a million times. Now the bikini area, (vay down there) you approach with a little more caution. This is a delicate area. It’s at that point you realize perhaps you are a bit over confident and not as thorough as you should be. You rinse and re-rinse the razor. Looks clean as a whistle. Nothing. You come to the conclusion the razor is dull. Yes, it’s brand new but you never know, the razor packer dude may have a duck problem as well. You got a bad razor, get over it. That’s when you see it. laughing (quacking up) at you…as if they saw it too. The protective cover on your new razor is still on it. While standing at your bathroom mirror blow-drying your hair, it is physically possible to fall into the shower. It is best to cut the protective seal off of baby lotion. Holding the bottle in your hands and pulling the seal off with your teeth will send an unexpected explosion of lotion into your mouth. You can fall not only down stairs, but up the stairs as well. I’ve learned that while listening to a lengthy phone message, even if you forget it is a message and respond to the caller, they will not reply. So you see, our ducks play an important role in not only our mental health but our physical health as well. Appreciate them, protect them. Did they leave on their own free will or were they duck-napped. It doesn’t matter; I just want my ducks back. I want them in a row, but if that never happens I’ll be o.k…as much as I miss them…I’ll be o.k! A few of the blogs I follow on a regular basis will occasionally do a re-post, a blast from the past. Surprisingly, even as long as I’ve been following them, a majority of them are new to me. You know where I’m going with this, don’t you? I thought I would be a copycat and every month or two, throw in my own random blast from the past. This was the first one that came to mind, as it was brought up in a conversation I had yesterday. Originally posted in July 2008…just another typical visit with my best friend. Perhaps she is relieved we can laugh about it now, and we are both alive to do so. She is one of the best friends I have ever had and I absolutely love my mini-vacations to visit her in Ventura. My last visit was memorable in more ways than one. We had spent the evening doing ‘girl’ things…painting our nails, eating, talking, laughing, crying, etc… We eventually fell asleep, safely watching t.v. “Anbesol, use some Anbesol” I mumbled between snores. “It always works for me” I lied. Evidently the coldness was adequate, at least long enough for her to fall back asleep. Had I unconsciously killed my best friend? I am now in panic mode. After opening her eyes, we both lay there in shock. Her t-shirt was soaked, as were the sheets and her pillow case. Now I am wondering, am I o.k? Perhaps one of us was bleeding to death and were too numb from the loss of blood to realize it. It had to be her, after all, it was her pillow and t-shirt that were soiled. I am now in an upright position and I’m o.k., Hallelujah! Not to get too excited, my friend after all is laying next to a puddle of blood. I bravely walk around to her side of the bed. Not too sure what to do next, we decide she should try to get up as well. She is now in an upright position and she’s o.k., Hallelujah! So now we both stand, upright, alive and confused. We decide to slowly disassemble the bedding, one piece at a time….th, th, that’s when we saw it. Imagine the horror/relief we felt when we discovered the “ice pack” she had grabbed in the middle of the night turned out to be a pound of frozen ground beef that had now thawed out. As disgusting as it was, we laughed so hard we nearly peed our pants. We might have! She made me promise I would never tell anyone, I am her best friend, I wouldn’t do that! I have a feeling we’ll be friends forever, after all, we have been through so much together. If we could survive a ‘bloody toothache’ together, we can get through anything! Love you D! You are currently browsing the archives for the	Blast From The Past	category. What's Left Of My Head is powered by	WordPress 3.1 and delivered to you in 0.186 seconds using 21 queries.